We love to travel not only locally, but throughout Spain, so I will also include information, from time to time, about where we have visited. Usually these places can either be driven to within a few hours of our home, east of Málaga, or we will have flown there from Málaga (AGP) airport. 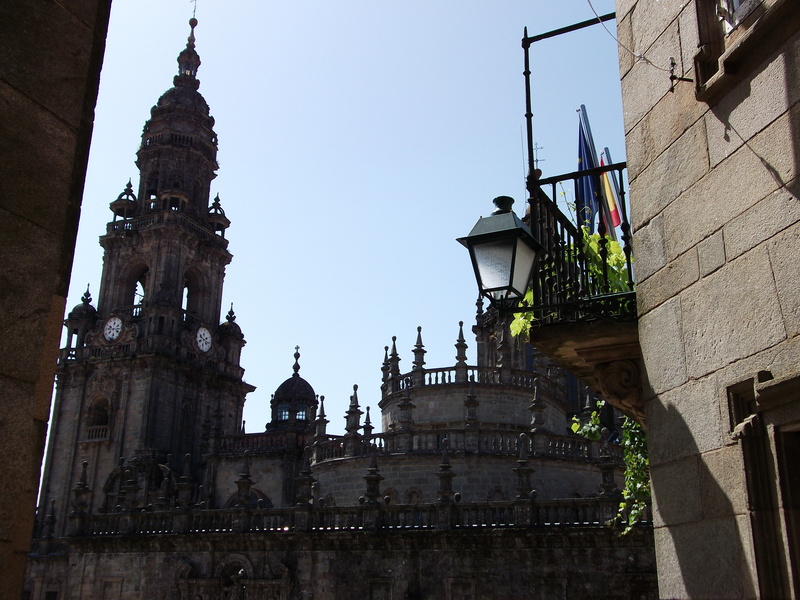 We managed to secure some cheap return flights with Ryanair from Málaga to Santiago de Compostela in northern Spain. Taking only hand luggage, our return flights were only €30 each, so if you have a few days to spare, it is well worth spending a couple of days in this beautiful city. 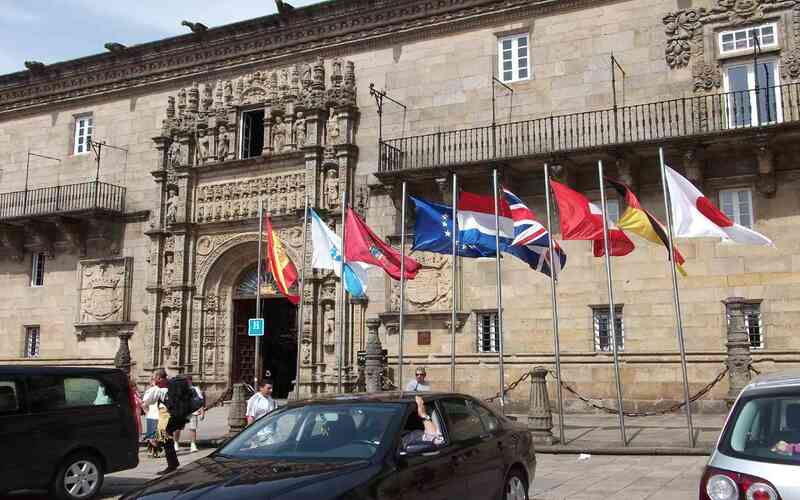 Santiago de Compostela is the capital city of the province of Galicia, Spain. The city’s Cathedral is the destination today, as it has been throughout history, of the important 9th century medieval pilgrimage route, the Way of St James … known locally as the Camino de Santiago. In 1985 the city’s Old Town was designated a UNESCO World Heritage Site. The cathedral borders the main plaza of the old and well-preserved city. Legend has it that the remains of the apostle St. James were brought to Galicia in the early 9th century on a boat made of stone, and were later discovered at Santiago de Compostela. The cathedral was built in his honour on the spot where his remains were said to have been found. The Camino de Santiago de Compostela, also known in English as “The Way of St James”, is a collection of old pilgrimage routes which cover all of Europe. They all have Santiago de Compostela in north-west Spain as their final destination. 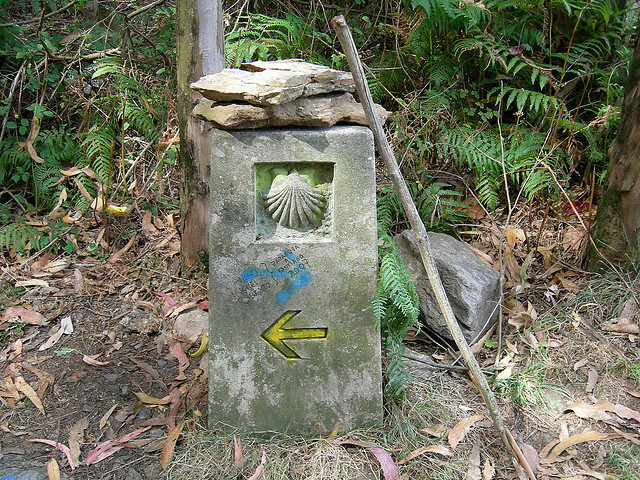 For more than a thousand years, pilgrims have been walking along the Camino de Santiago. The main Camino route is the Camino Frances. This part of the Camino de Santiago traditionally starts in St Jean Pied de Port, France, and finishes in Santiago de Compostela about 780km later, after travelling the breadth of Northern Spain, however, you can start anywhere and even continue past Santiago to the sea at Finisterre. It is interesting to know that Finisterre was once thought to be the “End of the Earth” in medieval times, when people believed that the Earth was flat. 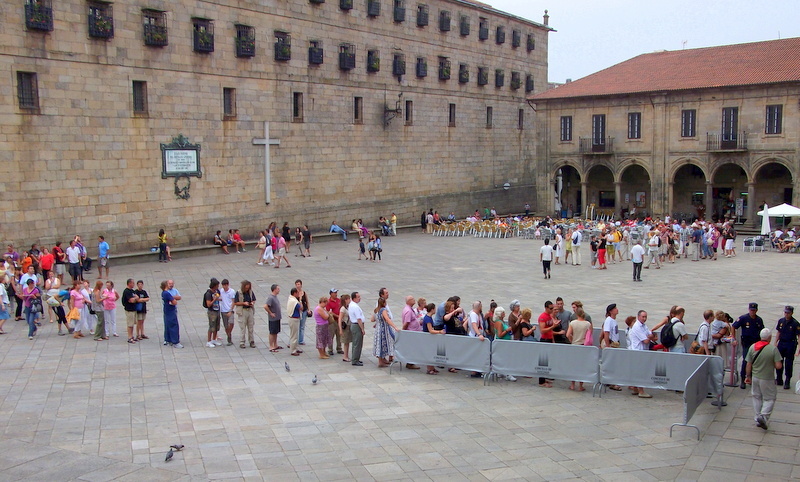 On arrival at the Cathedral in Santiago, pilgrims take their credencial or Pilgrim Record, duly stamped along the way, to the nearby Pilgrim Office and a Compostela certificate (still written in Latin, and confirming the completion of the pilgrimage) is generally issued. Walkers and pilgrims on horseback must have completed at least the last 100km and cyclists the last 200 km, in one stretch, to qualify. They will be asked their motivation, and those who do not count ‘spiritual’ as part of their reason for making the pilgrimage can obtain another document, a certificado, to attest to their having completed it. 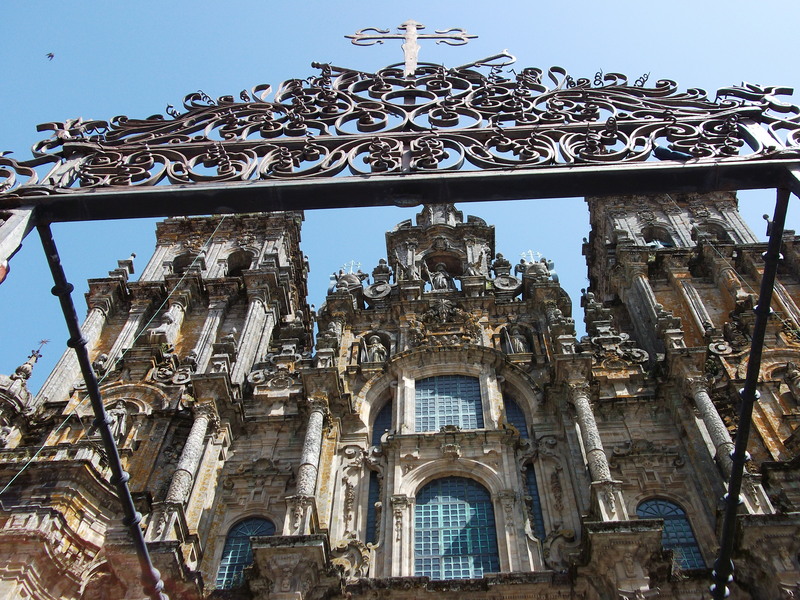 We weren´t visiting Santiago de Compostela to walk the Pilgrim´s Route, but to see the beautiful architecture in this World Heritage city … and we weren’t disappointed! We chose to stay at the Hospedería de San Martin Pinario which is a former monastery directly across from the Cathedral. During our first morning, we wandered around the city viewing the fine granite buildings, before a delicious Menu del Dia (menu of the day) at our hotel. We dined on huge plates of jamon serano and melon, cod, and pork ribs followed by baked apple and rice pudding. Included in the price of €12 was a bottle of wine between us, large bottle of water, bread and coffee … what a bargain! After lunch we wandered around the inner courtyard of the Hospedería before once again taking to the streets to see the city. We decided to view the interior of the Cathedral and joined the huge queue to hug the statue of St James standing over the high altar. Afterwards, we took the steps to his tomb in the catacombs, as previously visited by Pope John Paul II. 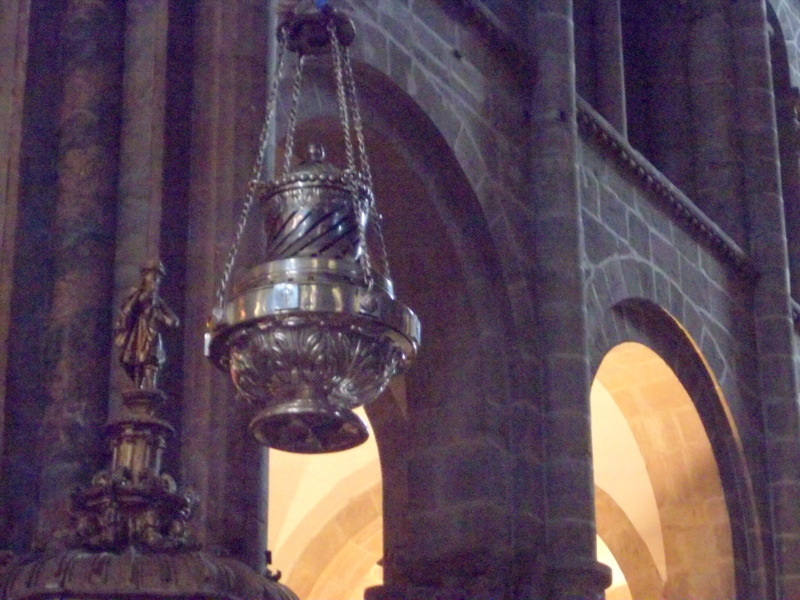 The Botafumeiro is a famous thurible found in the Santiago de Compostela Cathedral. Incense is burned in this swinging metal container, or “incensory”. The name “Botafumeiro” means “smoke expeller” in the Galician language. Sadly we didn´t get to see the Botafumeiro in action during a service, but it’s quite a sight to see, as it swings from one end of the cathedral to the other. 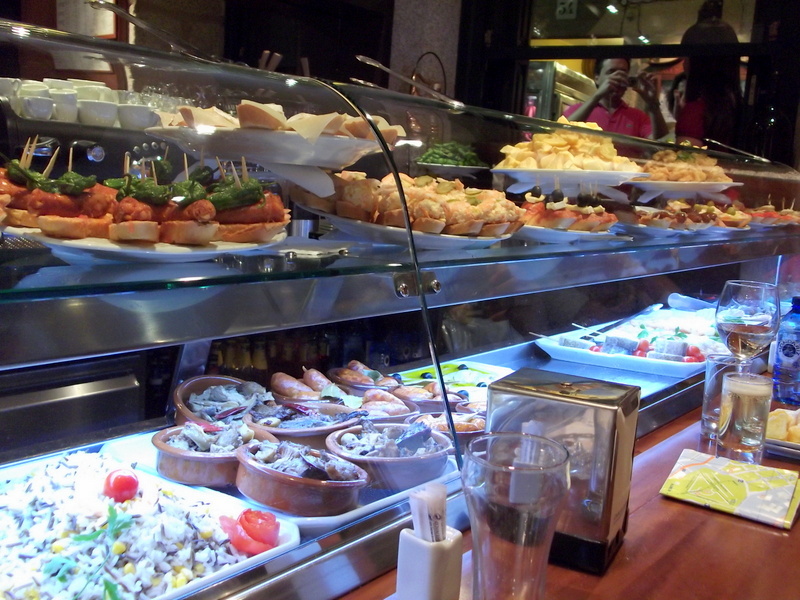 In the evening we enjoyed a wonderful selection of tapas at some of the many bars in the city. After a hearty buffet breakfast on our second day in Santiago de Compostela, we emerged from the hotel to an overcast but warm morning – and the sound of Galician bagpipes! We strolled across the old part of the city to the Mercado de Abastos which is the municipal market where the stalls held such delicacies as Padrón, cheeses, pulpo (octopus), lots of fresh seafood, meats, and locally produced vegetables. We bought some scallop shells (which are the symbol of the pilgrims of the Camino) and sat down for coffee outside San Fiz de Solovio, the oldest church in the city. 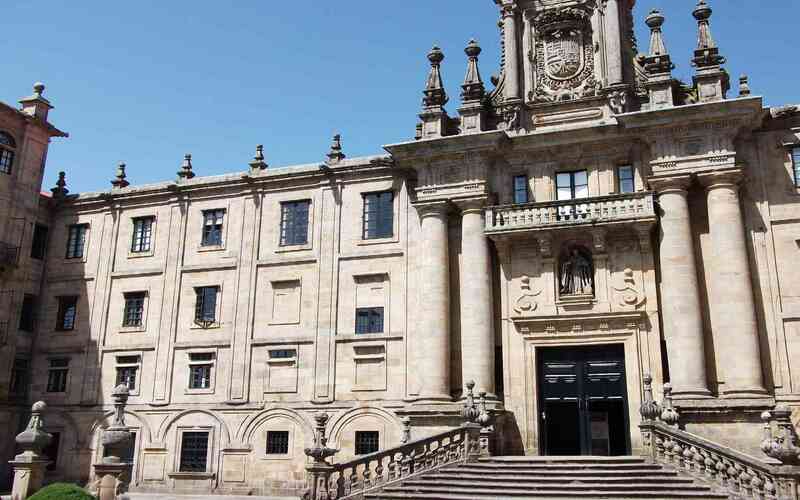 By now the sun was out so we headed for the main square, Praza de Obradoiro, for more views of the Cathedral as well as the Hostal dos Reyes Catolicos which is an extremely elegant five-star Parador. During the evening, we strolled back up Ruá do Franco, one of the main pedestrianized streets, to some of the many tapas bars for a selection of fine wines and tapas, followed by ice-cream and coffee. As our flight home wasn´t until late evening, our final day gave us the opportunity to revisit many of the places that we had particularly enjoyed during the previous two days. We wandered into the magnificent Hostal de los Reyes Católicos also known as the Royal Hospital, which was ordered to be built by the Catholic Monarchs to provide accommodation for pilgrims. Built between 1501 and 1511, the building was reformed during the baroque period. It is now one of the most luxurious Paradores, (which are state-run hotels) in Spain. The monastery of San Martin Pinario, where we stayed, was built in 1494. It was founded by a group of Italian Benedictine monks in order to watch over the mortal remains of the Apostle, St James and to pray. The name Pinario comes from the pines which were in the place where they founded the first chapel in the 11th century. Later on, when the Order achieved more splendour, they built the church and the monastery in 1494. It is one of the most important baroque buildings in Spain, together with the Cathedral, and one of the biggest of the country. Four Doric columns frame the door with the image of Saint Benedict in the centre. 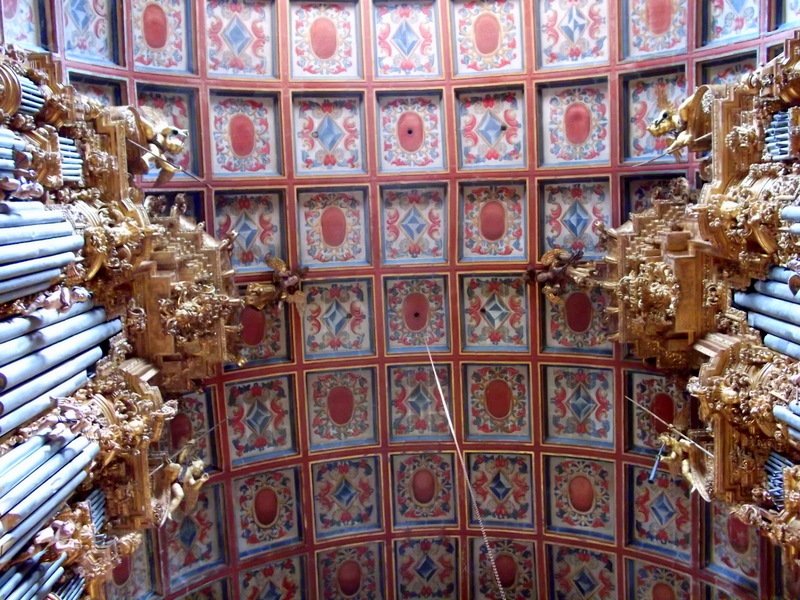 The upper structure consists of a coat of arms from Spain. The image of Saint Martin on horseback sharing his cloak with a poor person was added by Fernando de Casas in the 17th century. In this century the monastery suffered other modifications that ended in its current appearance, which shows a wide range of styles. Nowadays, the building is a museum, a hall of residences for men, occasionally a hotel from June until September and, mainly, the See of the Main Seminary and the school of Theology. The monastery church is entered from nearby Plaza de San Martin, unusually by a descending flight of steps. The church has a ground plan in the form of a Latin cross, and makes excellent use of the light which enters through its ribbed dome. 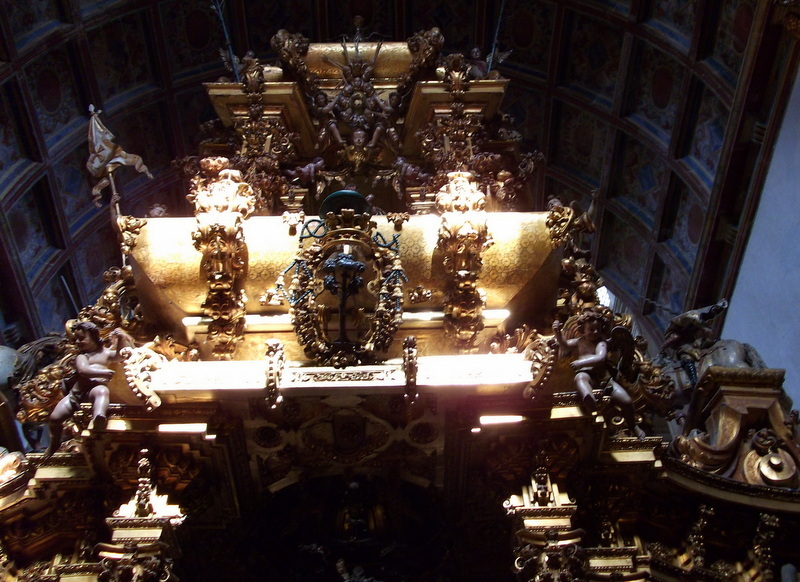 The outstanding feature of the interior is the richly-ornamented high altarpiece. This, along with the organs, choir stalls and various chapels, combine to make the monastery church an exceptional museum of baroque art. We spent well over an hour inside this beautiful church and were fortunate during most of that time to be the only people there. Where´s your favourite place for a weekend away? This entry was tagged Camino, Camino de Santiago, Europe, photography, Religion, Santiago de Compostela, Spain, travel. Bookmark the permalink. At this point, I have a loose plan to walk at least part of the Camino, next year. Early stages yet, but hopefully to raise money for charity too 🙂 Watch this space! I’ve been there several times but I wish I could take my kids!! Life just isn’t as easy or as cheap as a single mother! You’ve got to pay for 3 tickets for everything, buy 3 menus of everything, pay for a hotel room for 3………….! And no partner to help you with it all. But at any rate, was there a particular website where you bought the plane tickets? Or did you book directly with Ryanair? See ya! Yeah, me too – but that’s quite difficult to achieve in the cathedral in Santiago de Compostela – as you might imagine! Those first couple of shots are glorious, Marianne. I was staggered by the rail disaster. It’s awful when somewhere is on your mind and a tragedy like this happens. Thanks Jo. A terrible (and by some accounts, preventable) tragedy. Good post – thanks for the memory nudge. Galicia remains one of my favourite visits to Spain. Thanks Andrew – yes, Galicia is a great place to visit. Very different from my part of Spain. I’ve wanted to go there since the Shirley McLaine book! I´m glad you clicked through, as well, as I got the chance to learn about your travels together as a family. I´m sure you would enjoy a visit to Spain. The culture is very family-friendly, the scenery diverse, the history extensive, the people welcoming and the food delicious. What more could you want?! Thanks for taking the trouble to comment. I really appreciate it. Thank you for your visit and taking the trouble to comment. Much appreciated. No I haven´t done any of the Caminos, Marty – but I know that everyone who has always has great memories. Maybe one day! Brings back great memories of both my Caminos. If you have not done it Marianne, you really should!